I went for a 13.1 mile run on Saturday and it hurts a little to say this out loud but– I’m a wee bit injured. It’s true. I said it and I can’t take it back as much as I want to. I now have pain in my upper calf that extends into the back of my knee. I would like to thank all the downhills in the Sporting Life 10K for this injury. At the 13K mark on yesterdays Saturday’s run- my calf hurt. I just kept running through it and told myself I would have a hot date with my jacuzzi, muscle rub, foam roller, and my lovely compression socks when I got home. And that is just what I did! The pain is no longer there all the time and I will have to stretch and foam roll like no other to be 13.1 ready for the Toronto Half on Sunday. I have faith that I will heal by then. And with any luck, make it a 1:45. Also, I have a fun artist to share with you! 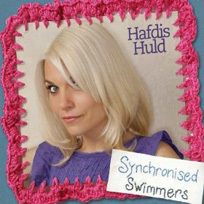 Hafdis Huld’s second album Synchronized Swimmers is perfect for a sunny summer day. You can listen to her entire album HERE! This entry was posted in Hafdis Huld, Sporting Like 10K by Siobhan McCarthy. Bookmark the permalink.